Hans Klüver learnt chess at 13 and composed his first problem one year later. 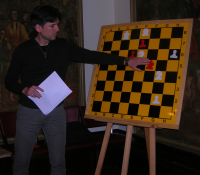 He has been interested in retroanalytical problems and in fairy chess: for instance he promoted Dynamo chess and Marseillais chess. He also invented the concept of metacritical move. Klüver held chess problem columns in 16 newspapers (in Die Welt during 40 years, from 1946 until 1989!) and wrote more than 150 articles, as well as several books, among which the famous "Erich Brunner - ein Künstler und Deuter des Schachproblems" (1958). More details in German on Wikipedia, thanks to Rainer Staudte. Attila Benedek started composing at the age of 40 and is the author of about 800 problems in all genres. 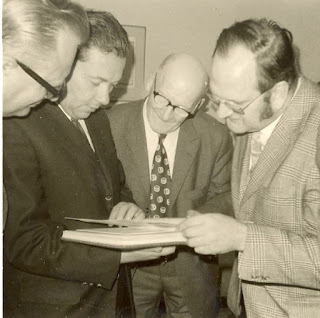 He was also an International Judge and the Hungarian delegate at the PCCC meetings during 20 years. He published a 82 page book about his career which can be downloaded and read from here. Triple switchback by bSd8 and switchback by each thematical white piece. Stanislav Maksimovich Tolstoy is the author of about 500 problems. Anti-Somov A1, Somov B2, Rukhlis. Zoltán Laborczi replaced Attila Benedek as the Hungarian delegate at PCCC. He composes in all genres, but lately seems to have preferred seriesmovers. A festival of consecutive self-pinnings and unpinnings. Stephen Rothwell composes in all genres, with a predilection for selfmates and fairy problems. 5 black pieces consecutively capture and are captured. Specific Andernach strategy. Robert Emden was a meteorologist, physicist and astrophysicist. 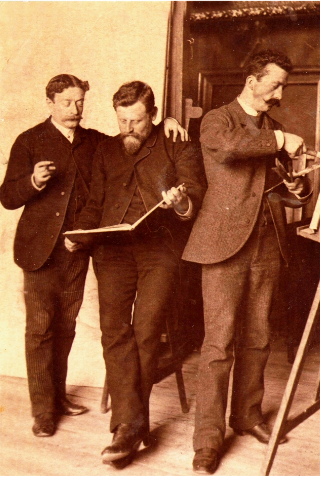 As a member of the Akademische Schachclub München (A.S.C.M.) he was the editor of their monthly review Akademischen Monatshefte für Schach. More information about him can be found on die Schwalbe website and a longer biography in "Robert Emden - Wanderer zwischen Welten - zu seinem 150. Geburtstag"" by Alfred Gautschy.